Enviva Partners LP has announced the execution of a new take-or-pay off-take contract to supply wood pellets to Lynemouth Power Ltd., a subsidiary of Energeticky a prumyslovy holding (EPH). Deliveries are expected to start next year. In mid-May, the owner of U.K.-based Lynemouth Power Ltd. issued a brief statement confirming plans to convert the power station to biomass are proceeding according to schedule. Doosan Babcock has been awarded a contract to convert the facility. The U.K.-based Port of Tyne has announced plans to start building new facilities to handle, store and transport wood pellets for Lynemouth Power Ltd., which is making good progress with its plan to convert from coal to biomass. On the court’s own motion, the U.S. EPA’s Clean Power Plan oral arguments scheduled for June 2 have been pushed back to Sept. 27, the U.S. Court of Appeals for the D.C. Circuit announced on May 16. On May 27, the USDA announced more than $8.8 million in awards through its Advanced Biofuel Payment Program, which makes payments to producers for advanced biofuels produced from renewable biomass other than corn kernel starch. The Enviva Forest Conservation Fund, a $5 million, 10-year program designed to protect tens of thousands of acres of bottomland forests in northeast North Carolina and southeast Virginia, has announced the recipients of its 2016 grants. Advanced Torrefaction Systems LLC has collaborated with the Idaho National Laboratory to test a catalytic oxidation technology designed by ATS to address problems that have hampered the development of large-scale torrefaction plants. Northeast Wood Products LLC commenced pellet production in December at its retrofitted 120,000-ton-per-year pellet plant located in Jasper, Tennessee, and now is poised for ramp up, but will wait on the sidelines until the market rebounds. Though an Idaho pellet plant project announced last spring hasn’t yet come to fruition, the project is still alive and working to overcome final hurdles. Centennial Renewable Energy plans to build the project on the site of a former timber plant. The International Renewable Energy Agency has released a report finding more than 8.1 million people worldwide are currently employed by the renewable energy industry, up 5 percent from last year. The report includes data on bioenergy employment. Estonia-based Hekotek has made two announcements regarding the development of pellet plants in recent months, including the development of a new pellet plant in Latvia and a pellet plant expansion in Belarus. The USDA Farm Service Agency has announced incentives will resume this month through the Biomass Crop Assistance Program. According to the USDA, $3 million is available for BCAP during fiscal year 2016. The U.S. Department of Energy has announced an open meeting of the Biomass Research and Development Technical Advisory Committee is scheduled for June 13-14 in Washington, D.C. Members of the public can observe the business of the committee. The USDA has announced the availability of $21 million in funding through its Agriculture and Food Research Initiative to support the development of regional systems in sustainable bioenergy and biobased products, as well as education and training. Effective May 12, Michele Rebiere has resigned as president of the Wood Pellet Association of Canada. Former vice president Rene Landry will serve as president until the next general meeting of the membership is held in September. Trestle Energy LLC and Larksen LLC have announced a collaboration to commercialize a new fuel pathway management platform to enable ethanol producers to reduce their fuel carbon intensity and facilitate the use of biomass pellets at power plants. 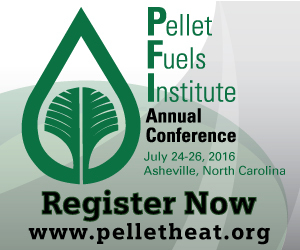 The Pellet Fuels Institute recently announced the qualification of two additional pellet plants into the Pellet Fuels Institute standards program, including NWP Jasper LLC and New England Wood Pellet's Allegheny plant. Repreve Renewables LLC celebrated the official opening of its North Carolina processing center on June 1. The company's primary crop is giant miscanthus, a high-yielding, low-input and drought tolerant perennial that improves soil and water quality. The Sustainable Biomass Partnership has announced that PricewaterhouseCoopers LLP (PwC), Canada has become the third SBP-approved certification body. PwC has been approved for certification of biomass producers in Canada and the U.S.
University of Montana researchers will use a grant awarded by the USDA and U.S. Department of Energy to identify and overcome the barriers to using biomass from fuels-reduction and forest-restoration treatments.